Young persons in the Territory are being urged to explore the world of knowledge available through the use of the internet by participating in a video competition in commemoration of World Telecommunication and Information Society Day. 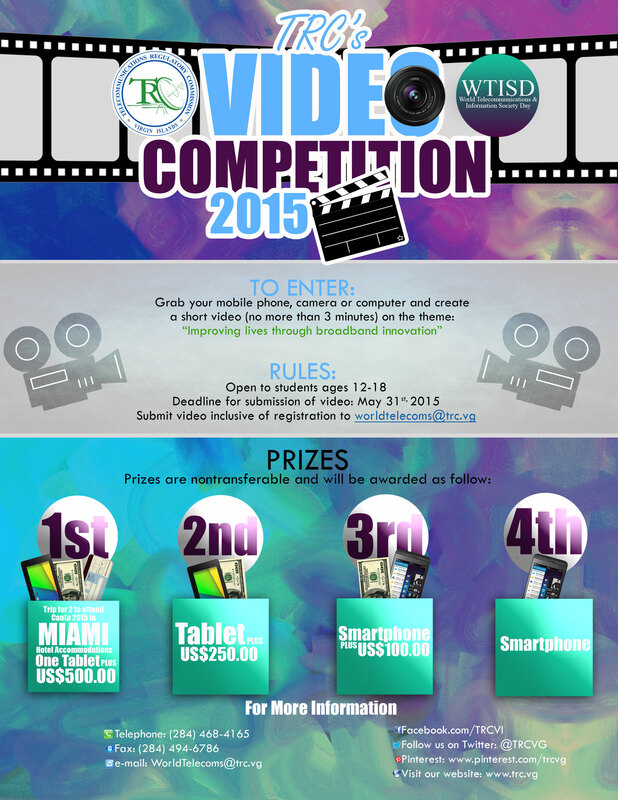 The video competition was launched by the Telecommunications Regulatory Commission (TRC) for students between the ages of 12 and 18, and must state in three minutes or less what “Broadband” means to them. The aim is to understand how broadband is affecting young people and how it is interpreted by this group as it becomes more prevalent in the Virgin Islands. Minister Vanterpool added, “I encourage our young people to continue to explore the world of knowledge available through the use of the internet, as we seek to improve our lives and develop our Virgin Islands”. Chief Executive Officer at the Telecommunications Regulatory Commission, Mr. Guy L. Malone, is excited about this campaign and said he believes that Information and Communications Technology (ICT) is very much a part of everyday life whereby technology impacts everything people do. World Telecommunications and Information Society Day will be celebrated on May 17 under the theme, “Improving Lives through Broadband Innovation”. The day, which has been celebrated annually since 1969, helps bring awareness to the possibilities that the use of the internet and other information and communication technologies can bring to societies and economies, as well as ways to bridge the digital divide. The TRC commemorated 50 years of telecommunication in the Territory last year by honouring persons in the community that contributed to telecommunications. The Commission’s 2013 campaign message was ICTs and Improving Road Safety while Women and Girls in ICT, was the focus in 2012. Deadline for video submissions is May 31, results will be communicated to winners on June 5 and winners will be announced to the public at a ceremony at Maria’s by the Sea Hotel on June 17. Prizes include smartphones, tablets, cash prizes and round-trip tickets for two to Miami inclusive of hotel accommodations. For registration forms and rules, visit TRC’s website at www.trc.vg or their Facebook page at facebook.com/TRCVI. You can also telephone at 468-4165 for more information.